London City Airport, predominantly used by London’s financial industry, operated the 9th most outbound flights from the UK in 2016. 52 destination airports can be reached from City Airport across Europe, as well as New York. This airport suffered a fairly average number of delays in 2016, but its ratio of cancellations was one of the worst in the UK. No matter which airline you were subjected to disruption with when flying from London City Airport, we’ll strive to uphold your right to compensation. By using our free online calculator you can check in a straightforward manner if you’re eligible for compensation. More detailed information as to your passenger rights and the EU law. Under which circumstances do flight delays qualify for compensation? When the delay reaches 5 hours or more, you’re within your rights to cancel your flight. The airline is obligated to either reimburse you the costs or offer you an alternative means of transportation. Delays that continue into the following day entitle you to a stay in a hotel and transfer to and from the hotel and airport, at the offending airline’s expense. Contact the airline directly and ask them to confirm this in writing. 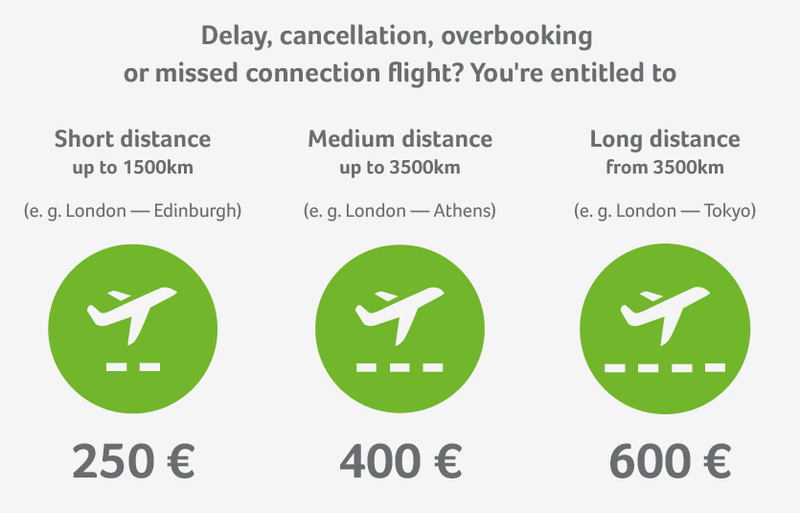 Important information: Don’t take the airline’s excuses! Vouchers for hotels, food or drinks don’t alleviate the airline’s obligation to pay your compensation. Our expertise enables us to enforce compensation at a highly successful rate. This is what gives us the necessary confidence to promise a completely free service should your case be unsuccessful! London City Airport has its record footfall of passengers in 2016, as 4.5 million people used it to fly between 52 airports. Edinburgh was the most popular connected airport, followed by Amsterdam and Dublin. 2016 saw London City Airport cancel 667 flights, over 200 more than Gatwick who had almost 40 million more passengers to contend with! There were far less delayed flights at City Airport, and it may be the case that, as they serve mostly travelling professionals, a lot of delays became cancellations due to missed meetings. Regardless of the reasons, the sheer volume of cancellations makes City Airport one of the least reliable to fly from in the UK. Wifi is complimentary at London City Airport 24/7, which makes sense as many of its passengers are on business trips. You can pre-register for this service and then login with your username and password. Should your flight be subjected to disruption because of strikes, you will be entitled to some additional services at the airport, and you might find that the airline organises alternative transportation for you. Compensatory claims for flight delays and cancellations are not valid in the case of strikes, as strikes are deemed to be an ‘exceptional circumstance’. More information about London City Airport can be found here.